Kelli bookends each day with a visit to the Caribbean Sea. Three to four days a week, Kelli Reese takes client calls from the jungle. The palm and banyan trees surround her patio, while colorful parrots caw and monkeys swing playfully through the trees. “It’s so peaceful. My clients can hear the birds chirping in the background,” says the former California-based CEO. “Tulum was calling me,” she says about her 2016 visit. “I got to the airport and said to myself that I would be back within the year to live… It took 18 months.” During that time Kelli left her six-figure job, went through a separation, and started a new business. She gave herself a trial month in Mexico in August 2017. “I came for a month and tried it out. I’m a big proponent of testing the waters.” She stayed in Tulum and also went further south for a week to Bacalar—an area known for its beautiful lake of shifting shades of blue. In each place she stayed in vacation rentals so she’d have a feel for what it was really like to live there. Her experience confirmed that Tulum was the right place for her and she moved full-time that September. “I spent the first seven months living in an apartment in town.” It served as a good foundation as she got acclimated to her new life. Her coaching business focuses on empowering women to navigate life’s transitions and uncertainties through a unique blend of business-savvy and spiritual-based practices. She can set her own hours, plus, her portable business can go anywhere there’s a WiFi connection. Now, Kelli rents a two-bedroom, two-bathroom home, with a beautiful kitchen, picture windows, and a spacious patio just outside of Tulum. This five-acre slice of paradise rents for $1,100 per month. To get around, she rents a car for a few weeks at a time. 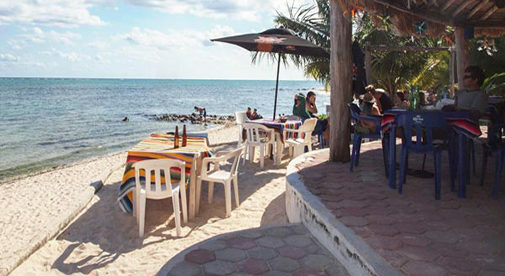 Long-term car rental in Tulum can be had for as little as $50 per month. She shops at nearby markets, including a modern supermarket for the essentials. Even organic fruits and veggies are economical, and Kelli estimates she spends about $70 every two weeks on groceries. Besides her coaching calls, Kelli also spends a lot of time meditating, cooking healthy meals, and writing. She can now add best-selling author to her resume with her new book, The Destiny Road Map: The Little Guidebook to Face Your Fears, Embrace Change, and Follow Your Heart.